Four people have died in a helicopter crash in Phoenix Arizona. The accident occurred when news choppers following police involved in a high speed car chase collided. There were no survivors. The story is tragic, both because of the lives lost and because of how unnecessary their sacrifice was. Journalists have died uncovering the truth about politicians in repressive countries. War correspondents have fallen while reporting on military operations and their impact on foreign peoples. But these four people died trying to get the best camera angle of a high speed pursuit. 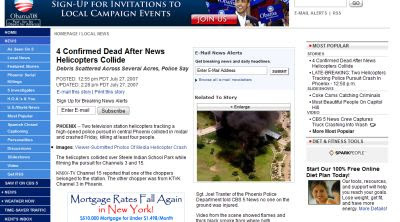 The helicopters belonged to KNXV Channel 15 and KTVK Channel 3 in Phoenix. A rival station, KPHO Channel 5 has the story on their website. But they also have viewer-submitted photos of the crash, because you know, if it bleeds, it leads. And what do you get when you finish looking through the slideshow of user-submitted photos?